Just did a bit of British Airways lounge wine sampling (BA Galleries lounge at terminal 3). These are wines available in business class. How good are they? The answer: not bad, but not very exciting. Unfortunately, like many airlines, I suspect BA have very little budget to spend on wine, and this selection shows it. The best business class selection I have come across is Air New Zealand, where they use the opportunity they have to showcase the best Kiwi wines. Even their economy class selection is quite good. I’ve not done Singapore business class for a long time, but that used to be quite smart. I’ve yet to fly anything other than economy with Emirates, but I imagine this selection would be interesting. 4 comments to Some BA lounge wines: what does business class get you these days? 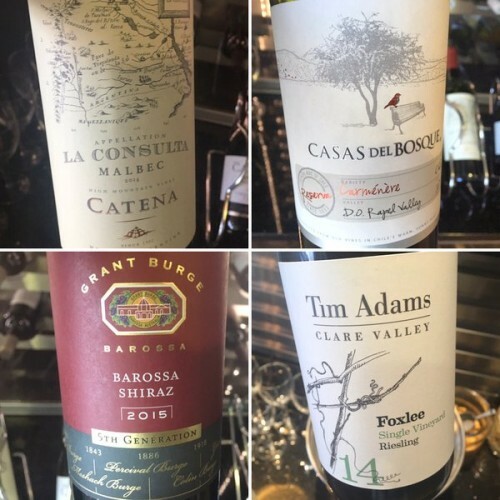 Interesting post – Part of me just wonders if you would have rated the wines as “low” if tasted blind at some wino’s dinner somewhere. Either way I’m sure these are the sort of wines most people would enjoy, which I guess is the point in the BA lounge. Sadly not everyone’s a wine nut. Not sure I agree with you on this one Keith. I think these wines are fine for business class, whilst you wait for your connection or whatever. If they had anything much more expensive – with the current pay-related strikes going on – I might be thinking they had their priorities wrong. If they had anything much whackier, it might polarise customers. This is a safe choice for a glorified bus stop. It’s not a wine bar.